I Love Brisbane. This travel and tourism blog aims to discover the hidden and not so hidden delights of Brisbane city, Queensland, Australia. On a regular basis, photos and articles of particular elements of the city are posted. South Bank Parklands are on the southern bank of the Brisbane River, at South Bank, directly opposite the CBD. The parklands are connected to the central business district by the Victoria Bridge at the northern end and the Goodwill Bridge at the southern end. It features 17 hectares of lush gardens and lawns. There are markets, shopping, restaurants, cafes, accommodation, swimming on a man made beach, and numerous other activities to partake there. I believe it is one of the best parkland areas in the world. The obvious feature, given that they are parklands, is the lush nature of the greenery. Nowhere is this more apparent than in the Rainforest Walk area, which is in the northern section of the parklands. There are a number of raised wooden walkways, which meander through, around and over water features, thick ground cover, and are shaded by the overhead canopy of a replicated rainforest. There are stairs in certain areas, although if you are wheelchair bound there are multiple access points so you can enjoy it regardless of these types of obstacles. My kids love South Bank, not only because it means they're going to get Ice Cream, but because of the vast array of activities there. Whenever we walk through the Rainforest Walk, we always discover lizards or wee beasties which my middle son delights in discovering and pointing out. My eldest loves that there are so many people around that he can annoy, and the toddler spends most of the time pointing at things saying "What's that?" What more can you ask for of an area which excites and engages their senses. Oh, and gets me Ice Cream as well! Cheers, I Love Brisbane, Wes. Click Here for the Google Map Reference for this post. As I wrote yesterday, Forme del Mito, or Forms of Myth, is a group of bronze sculptures located in King George Square designed by Italian artist Arnaldo Pomodoro. Each figure represents a force and principal character from the Greek tragedy of Agamemnon. We left off yesterday as Agamemnon had sacrificed his daughter Iphegenia to gain favour with the gods as he went to fight the Trojan War. The war spanned several years and after the capture of Troy, Cassandra, doomed prophetess, fell to Agamemnon's lot in the distribution of the prizes of war. Agamemnon returned to his kingdom with Cassandra, however in his absence his wife Clytemnestra had taken a lover Aegisthus. Together they plotted to murder Agamemnon and Cassandra. They were invited to a banquet at which they were treacherously slain. Clytemnestra wrath at the sacrifice of Iphegenia, and her jealousy of Cassandra, are said to have been the motives of her crime. Here, Clytemnestra is represented as the cylindrical shape in the foreground with the form of ambition. Aegisthus is in the background in the form of the machine. The fourth of the sculptures represents Cassandra, in the form of prophecy. The tragedy continued in that Agamemnon's son, Orestes, in turn avenged his father's death by killing his mother Clytemnestra, and Aegisthus, although this led to his downward spiral into madness. I would bet that many people look at these sculptures and might think "Dalek", or "Golden Music Box" - but not many would think they represented Greek Tradgedy in all its messy glory. Another reason why I love Brisbane, because our cultural diversity is so obscure! Forme del Mito, or Forms of Myth, is a group of bronze sculptures located in King George Square, between Adelaide and Ann Streets. Brisbane City Council purchased the pieces after the finish of World Expo 1988, for which they were brought to Brisbane. Designed by Italian artist Arnaldo Pomodoro in 1983, the Forme Del Mito is derived from the Greek tragedy of Agamemnon. Each figure represents a force and principal character from the tragedy. In mythological Greek tragedy, Agamemnon was the King of Mycenea. In representations of the Trojan War, Agamemnon led a campaign to conquer Troy and rescue Helen, who had been abducted by Paris. Before leaving he sacrificed his daughter Iphegenia to obtain favourable winds from the Goddess Artemis. The first of these sculptures in the form of a powerful pyramid represents Agamemnon. I've decided to split this post into two, as there are four pieces and characters represented with this sculpture. Therefore to do it justice, I'll finish the story of Agamemnon tomorrow. Old Government House is located on theQueensland University of Technology Gardens Point campus at 2 George Street. If you travel down the pathway beside the campus as you come from George Street, you will hit this heritage building, opposite the Gardens Theatre. Old Government House was the official residence of the Governors of Queensland from 1862-1909. Since that time the house has been occupied by the University of Queensland, the National Trust and the Queensland Institute of Technology. Old Government House was the first major building constructed by the Queensland Government. It was built from 1860-1862 at a cost of £12,000-£17,000 and designed by the Colonial Architect Charles Tiffin. This classical revival style residence was home to eleven of Queensland's Governors. In 1910, the then Governor Sir William MacGregor moved to Fernberg, which would become the current Government House. At that time it was handed over by the Government to form the nucleus of Queensland’s first university. Guided tours of the house are available on request between 10.00am and 4.00pm Monday to Friday. Online you can do a Self Guided Tour or a Virtual Tour, but nothing beats going there in person. I personally like the relaxed feel of the courtyard, but the main rooms are also architecturally splendid. I bet that most of the students who go to QUT don't recognise the historical significance of the building on their great campus. As the associated plaque mentions, one of the greatest successes of the streetscape of World Expo 88 was the series of sculptures known as The Human Factor. Created by John Underwood's Artbusters organisation, The Drovers captures five of these figures in a typical Australian outback scene. They are located outside the Primary Industries Building at 80 Ann Street. Now made of cast aluminium, the sculptures were originally created in fiberglass. After nearly 17 years had begun to show their signs of wear. They were recreated in 2005 to preserve the sculptures, and as a continued reminder of the positive impact Expo 88 had on the city. Much was made of this recreation, as the "bushies" had returned to the city! To me, World Expo 88 represents when the city grew up. I came up from Victoria with one of my mates specifically to attend the exhibition. Prior to that Brisbane was more like a big country town, but the turning points seemed to be the Commonwealth Games in 1982, and then this significant world event. Over 18 million people visited the city for the exhibition. With sculptures like these they truly did get to see a little slice of Aussie life. Brisbane Arcade is located at 160 Queen Street Mall in the Central Business District. It houses stores which sell award-winning fashion, fine jewellery, bridal accessories, homewares and antiques, along with having some fantastic cafes. This happens to be all in the one elegant, heritage shopping galleria. It covers three levels: basement; ground; and balcony. It spans from the Mall through to Adelaide Street. The Brisbane Arcade was built in 1923 for Dr James Mayne, and his sister Miss Mary Emelia Mayne, part of the infamous Mayne family. The site was previously occupied by the family home. The Arcade was designed by Richard Gailey (Junior), who is regarded as one of Queensland’s most prolific and important earlier architects. Despite the infamy and enormous wealth of their father, these children were quite philanthropic in donating back to Brisbane. The Arcade continues to be operated today by the Trustees of the estate of Dr James O’Neil Mayne and the estate of Miss Mary Emelia Mayne. The brother and sister were two principal benefactors of the Queensland University, enabling relocation to the St Lucia campus. Operating proceeds from Brisbane Arcade are for the direct benefit of the Medical School of the University. Like many sights within Brisbane, with your dose of shopping you can also get a dose of history. In this case it is both unique and fascinating on both fronts. The shopping in this mall is upmarket, and most stores are incredibly well presented and sophisticated. The architecture within the mall is spectacular. The history is also enthralling. The Mayne family amassed incredible wealth, but the deathbed confessions of murder by their main patriarch, Patrick Mayne, brought into question the original source of the wealth. However, the children in their own rights did not deserve the disapproval and disdain they received due to the actions of their father. Aquativity is a new interactive water play park which has recently been opened at South Bank Parklands. Located adjacent to the Streets Beach, it offers a range of pool and play areas suitable for toddlers through to teens. It was built at an estimated cost more than $4 million by Splat landscape architects who have done many large scale projects around Brisbane. Construction was started in May 2006, and finished early this year. With the drought they have also had to consider the incorporation of low water use features to match seasonal demands. They have done a wonderful job putting this together. Even though today it was raining when we finally made it to South Bank, there were still a number of kids playing in the area. Due to the drought, not all the features in the park are working, but many still are including the guided water jets and the interactive water fountains. They also make it clear that the water to fill the park was trucked in from outside the current drought areas. I can't wait to take the boys back with their swimmers, and from the looks on their faces, I don't think they can either! In the Tank Street forecourt of the Commonwealth Law Courts are a number of sculptures by renowned Australian sculptor Robert Klippel. Klippel is well known for his abstract assemblages fashioned from scrap metal, and the collection of five pieces on display here show that all too well. They were created in the late 1980's and include the pieces numbered 661, 664, 773 804 and 807. They are representative of his work during the 1980's when he produced over 200 sculptures in that period alone. Many of his works are not identified by a name, but simply by a number, leaving the viewer to interpret what the artist is (or, for that matter, isn't) saying with the piece. Robert Klippel was born in Sydney, Australia in 1920. He was 24 before he began night classes at art school, and he only spent one year as a full-time student before leaving for London in 1947. He also spent time in Paris, and the influence from Surrealism he received is shown in his work throughout his career. In the 1950's he moved to the U.S., including a stint teaching in Minneapolis. He returned to Australia in 1963. With a collective career spanning nearly 60 years he amassed well over 1,000 sculpted pieces, along with a huge collection of drawings on paper representing his work. He died on the died on 19th June, 2001 aged 81. I must admit that when I viewed these works, in my ignorance I really had no idea of the significance of the sculptor. Sure, the associated plaque spoke of his eminence, but I disregarded this as mere hype. However, in reading the reviews and obituaries associated with Klippel, I'm now convinced that he truly was an outstanding figure in Australian Art. I'm incredibly proud that although many of us may not know it, we have sculpture of such international significance outside our public buildings. Artistic culture is alive and well in Brisbane. The Banker is a 15-metre high aluminum mural signifying the role of banking in supporting industry. It was installed on the Post Office Square facade of the Westpac Bank at 260 Queen Street in 1970, and still is a striking monument today. Leonard Shillam began the work in 1969 with the medium used being painted plaster and wire. On the same wall inside the building there is a smaller Shillam sculpture signifying the city and communications. Leonard (Len) George Shillam was born in Brisbane on 15 August 1915. Together with his wife Kathleen, their dedication to art was total. They helped establish the Queensland Society of Sculptors, and undertook teachings and educational seminars on art on numerous occasions. Len undertook many public commissions between 1949 and into the early 1990s, and must be seen as one of Queensland’s most experienced public artists. Len died on 1 September 2005, and Dorothy Hartnett wrote a fitting tribute to her friend in one of the local papers. The State Library of Queensland also has an excellent collection on their works entitled The Len and Kath Shillam Papers. To me sculpture has always been a kind of parallel creation, which reflects, but does not copy or reproduce, the creations we see in the natural world around us. It does not detract in any way from the wonder of the world we live in, but adds something to it which emanates from the artist himself, or herself. Right now there is a significant amount of construction going on near King George Square on the Inner Northern Busway. This section represents the construction of the busway from Queen Street to Upper Roma Street, which commenced in June 2006. This has resulted in the closure of a significant portion of King George Square, and a relocation to storage of many of the sculptures and public features there. This new section will allow buses travelling north and west to bypass traffic congestion in Brisbane's CBD by constructing tunnels linking the Queen Street Bus Station (underneath the Myer Centre) to Upper Roma Street, where it will connect with the existing Inner Northern Busway. There are two tunnels being built as a result of this work. It is currently scheduled for completion in late 2008, and as I understand it they are on schedule. There is a consortium of contractors working with the city council and government to complete the work. If you want, you can download a flythru of the proposed completed work. The main aims of the roadworks are to reduce travel time for the bus network, and reduce traffic congestion on the main arterial roads through the city. Aside from housing the Brisbane City Council, Brisbane City Hall houses the Museum of Brisbane. The Museum entrance via City Hall is located at King George Square, between Adelaide and Ann Streets. The Museum has four Spaces in which exhibitions are held, along with specific theatre areas for lectures and presentations, and discovery areas for kids. Most exhibitions are free, and they offer guided tours of the exhibitions on specific days. The Museum is open daily from 10:00am to 5:00pm. At the moment they are changing over some of the exhibitions, so some of the spaces were not accessible. However, the Lord Mayor's Photographic Awards 2006: Secret Treasures of Brisbane was still on, and will run until only the 25th of March. Some of the photographs are sensational, and the commendations and awards for winners are well worth it. Along with the photographs are some objects and pieces from people's homes, museums and private collections which also represent Secret Treasures. This copy of the William Bligh's account of the Mutiny on the Bounty in particular caught my attention. The Museum of Brisbane is highly accessible to visitors to the city. They have a distinct flavour in featuring both Brisbane history, and emerging artists and cultural exhibitions. It is fantastic that we have this as this type of venue. It also provides an active and participative place for our kids to explore and engage in the exhibitions, and I've always felt being immersed in something is the best way to learn. What is now Macarthur Central at the corner of Queen Street and Edward Street was formerly the AMP Building. The AMP Society was formed in Sydney in 1848/49, and was one of a number of benefit and friendly societies established in the Australian colonies from the mid to late 19th century. Effectively, they were insurance agents. In 1931-34 the AMP Building was erected at this site. The statues above the main entrance in Queen Street were carved by Fred Gowan of Sydney from Sicilian marble. This represented the emblem of the AMP. The tableau illustrates the AMP Society's motto "Amicus certus in re incerta" - "A certain friend in an uncertain event" or alternatively "A sure friend in uncertain times". It depicts an erect female figure, with a cornucopia by her right side, holding the palm of victory in her left hand. To her left is a seated woman and child; to her right a seated male. It has also been suggested that the figures represent Strength, Plenty, Production and Growth. Although AMP is no longer in the building, the tableau has remained in all its glory. I love how I stumble across these symbols as I walk through the city centre now. I have walked past this site many times, but before this year had not stopped to consider what these figures were, nor what they represented. I'm growing to like my new found appreciation for the city and what it holds: its ties to the past and its position for the future. All these things are represented within this one group, and I'm glad it remained on the building. This is a picture of an antique lift. It is located within Brisbane City Hall, which is in King George Square, between Adelaide and Ann Streets. City Hall has an imposing Clock Tower, allegedly based on the design of the St Mark's Campanile in Venice, Italy. Imagine my delight when I found out that you could catch a lift on the fully restored antique elevator up to the clock tower, 76 metres above the City Plaza to the observation deck. The tower itself reaches 92 metres. The lift operates from 10:00am to 3:00pm Monday to Friday, and was ideal for a late lunch! Its free as well, although you might have to share the lift with school kids. It is quite unassuming when you walk up there and discover it. The four clock faces on each side of the tower are the largest in Australia. Each face is made up of 1 tonne of slivered white opal. They are almost 5 metres in diameter, and the minute hands are made of sheet copper at three metres in length. The hour hands are shorter at 1.7 metres. The chimes are Westminster containing 5 bells. The chime bells weight 3 tonnes each, and the hour bell weights 4.3 tonnes. Up until 1973 the clock tower was the tallest structure in Brisbane. It was in the late 1960's that they relaxed the laws relating to height restrictions for CBD buildings, and since then the views have largely been built out. This shot aims towards the Southbank area, with Stefan's Skyneedle (the Expo Sky Needle) in the distance. Imagine the view from here in the 1970's or earlier as Brisbane was coming of age. In the yard of the Cathedral of St Stephen is a sculpture honoring the Right Reverend James O'Quinn who was first Catholic Bishop of Brisbane. The Cathedral History outlines how the first St Stephen’s church became a cathedral when James Quinn was appointed first bishop of the diocese in 1859. He arrived in Brisbane on Friday night 10th May 1861 and, the following Sunday in St Stephen’s, took possession of the diocese. Two and a half years later, on the feast of Stephen in 1863, he laid the foundation stone of a bigger cathedral. Bishop Quinn was born on the 17th March 1819 at Rathbane, County Kildare, Ireland. He was consecrated in Dublin on the 29th of June, 1859. In 1860 there were only two priests, two churches, two small schools, and 7,676 Catholics, out of a total population of 28,056. He established a Catholic paper, "The Australian", funded two orphanages and an industrial school, erected the cathedral of St. Stephen, and created and conserved rich educational and other endowments. State aid was finally withdrawn from all denominational schools with the close of the year 1880; but at his death, 18th August, 1881, there were 52 Catholic primary schools in the diocese, attended by 6,510 children. In researching Bishop Quinn, it is true he achieved a great many things during his time in Brisbane. However, he wasn't without his detractors. His religious zeal, and his founding of the Queensland Immigration Society which brought out ten ships with about 6000 migrants, mainly Irish, didn't endear him to all and sundry. He seemed to court controversy both within and outside the church during his time as Bishop. He is a significant part of Brisbane's early history, and has left a lasting legacy with the establishment of the Cathedral. The pub has varying breakfast, lunch and dinner menus, with a good variety of reasonably priced fare. They also have a good wine and beer list, catering for most tastes although quite generic in nature. The pub is available for functions, and was a well known haunt for the Barmy Army during last years Cricket Ashes series. They also show English and Scottish Premier league football on large screens within the drinking area. With today being St Patrick's Day, there has been a distinctly Irish feel around the city. Many people are out and about with the green and luck of the Irish. Alledgedly there are more Irish here in Brisbane than any of the other capital cities of Australia. And although it is a British oriented pub, you can be guaranteed that in the evening they'll be as Irish Green as any of the other pubs around the city. Queens Plaza, a major shopping area within the Central Business District, has frontages on Adelaide Street, Queen Street Mall, and Edward Street. Open most days from 9:00am to 5:30pm, the plaza hosts a number of specialty shops, a food court, and its main retail tenant, David Jones. The centre is managed by Gandel, a major retail leasing company in Australia. Other than David Jones, Queen's Plaza hosts a range of top flight stores, including Louis Vuitton and Tiffany & Co. Food is available at the basement food court, and the supermarket chain Coles has also opened in the basement area. Car parking is available under the building. Further expansion is planned later this year. If you want up-market shopping this is one of the premier shopping areas in downtown Brisbane. Every store is well presented, and although my wife would definitely tell you I'm no fashion guru, I do know there is a lot of good stuff and high class fashion available here. It also is gonna cost you! The marketing blurb perhaps explains it best: QueensPlaza is Brisbane's centre of stylish elegance, with a glowing pearl-like appearance that allows each beautiful store to shine. On the corner of George and Alice streets, is the Queensland Club building. The Queensland Club building was constructed between 1882-84, however the club itself was founded in 1859 just four days before the separation of Queensland from New South Wales. Both building and club are important in demonstrating the pattern of Queensland's history whereby British society heavily influenced colonial Australian ways of life. The club replicated a British, class oriented gentlemen's club. The building was designed by Scottish architect Francis Drummond Greville (FDG) Stanley. Born in Edinburgh in 1839, he trained in Scotland as an architect and emigrated to Brisbane in 1862. Eventually he was appointed Colonial Architect from 1 January 1872, a position he held until 1881. Stanley was a prolific architect and his work is found throughout Queensland. In this instance, the heavy walls, columns and spacious balconies evoke a tropical version of a traditional London club. It originally contained 41 members' bedrooms, eight bathrooms, a clubroom, dining room, billiard room, smoking room, visitors room, offices and the necessary kitchens, servants rooms and toilets, providing a `home away from home' for society's male elite. The building is beautifully designed, and reminds me of Raffles Hotel in Singapore. As I understand it, it is still run as a private club via invitation only, so getting access inside could be difficult without someone in the know. I'm amazed about how little on the Internet there is about its activities today. From what I can gather it was quite the club for the rich and elite in society, which probably remains the case. The South West Pacific Campaign Memorial is located on the Adelaide Street side of ANZAC Square. The memorial was unveiled on 29 August 1992 as a tribute from the Brisbane City Council. The unveiling coincided with the 50th Anniversary year of the Milne Bay and Kokoda Campaigns. Created by Artbusters, the statues of the memorial have been cast in bronze. It also includes a granite plinth, mosaic and brass infill. The Kokoda Trail campaign was part of the Pacific War of World War II. The campaign consisted of a series of battles fought from July 1942 to January 1943 between Japanese and Allied forces in what was then the Australian territory of New Guinea. The memorial depicts a wounded Australian soldier descending the Kokoda Trail assisted by a strong dependable Papua New Guinean leading him to safety. They are being passed by a fresh, determined soldier, resolute in the task ahead. Australian allies fighting in this battle did an amazing job of defending the trail, as did the Fuzzy Wuzzy Angels supporting them. 6000 Australian lives were lost in the campaign. With the Kokoda, and subsequent New Guinea campaigns, this was the first time that Australia's security had been threatened directly. In Australia for many years there was strong resentment towards the Japanese over the War, however, as time has passed today we share strong economic and friendly ties. Even this week, we had both Australian and Japanese prime ministers outlining a Joint Declaration on Security Cooperation. We should move forward, but We Will Remember Them. If you've ever been stuck for conversation, perhaps you would be wise to study the sculpture known as Dialogue located outside Macarthur Chambers on Queen Street. Made of cast bronze with a granite plate, it features two figures - a man and a woman - poised at a particular point of conversation. It was commissioned in 2004, and sculpted by Cezary Stulgis. This would be one of the most prominent pieces of public art in the city. On the Post Office side of the street, it is across the road from one of Cezary's other works, the Overseer. Depending on the angle you view the piece, the conversation could be interpreted as many things: indifference by the man and defensive by the female; the woman waits, anticipating the conversation as the man prepares his seduction; or an air of misgiving hanging over both, that this may be the last dialogue they have. I am rapidly becoming a fan of Cezary's work. I love the way he captures the human form, in all its frailty and magnificence. The beauty of the forms, in particularly the heads and faces, I find are done in such a way that I can admire the skill in which they have rendered, but to which I can apply my own interpretation. By this I mean that they are not so perfectly rendered that you only see one form. For me, I see many, and that's why I love these works. The City Garden's Cafe is located at the top of the City Botanic Gardens, near the Dragon Tree. It is open seven days a week between 8:00am and 4:00pm for breakfast, lunch and morning and afternoon tea. The cafe was formally the curators residence, built in 1903. This itself was a replacement for the original curators cottage which was washed awayin the 1893 floods. During world war two the building was used as a Ward room for the WRAN officers of HMAS Moreton. In its present form, the City Gardens Cafe was opened on the 7th of September, 1989. This venue is available for functions and events seven days a week. This includes wedding receptions, engagement parties, bridal showers, post-christening celebrations, birthday parties and corporate events. The menus are quite varied and reasonably priced in the restaurant itself. They are also licensed, so you can have a wine, beer or spirits with your meal. There is no denying that surrounded by manicured lawns and sub-tropical rainforest, City Gardens Cafe offers patrons a unique dining and function experience. You also get to dine with some of the local fauna, well, the sculpted kind anyway. The only word of warning I could offer is that on Public Holidays the surcharge, particularly at the kiosk, can be a bit of a sting. However, you could consider it part of the experience, and it has to be worth it for the views. 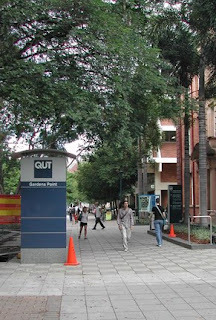 The Queensland University of Technology Gardens Point campus is located on the Brisbane River in the Central Business District, next to the Botanic Gardens and Parliament House. If you travel down the pathway beside the campus as you come from George Street, you will hit the Gardens Theatre. 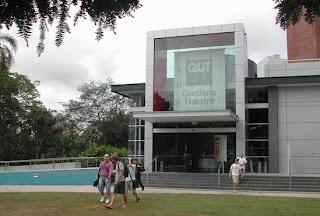 Gardens Theatre is one of the premiere Brisbane venues for theatre and live performance, featuring professional theatre, comedy, children's theatre and student showcases. The foyer features panoramic views of the City Botanic Gardens, a sprung floor studio and a courtyard atrium in open surrounds. The venue accommodates around 400 people. The theatre is part of QUT's cultural precinct. The theatre was formerly known as the Basil Jones Theatre, and was renovated with assistance from the Queensland Government. It was reopened as the Gardens Theatre in 1999. Since then, every year the theatre offers professional theatre seasons with a range of well known plays presented, often starring well known Australian and international actors. I've been asked before what kind of theatres Brisbane has, and my immediate reaction had been to mention the Lyric Theatre, which is part of the Queensland Performing Arts Centre. As I've wandered around the city, I've found other locations for performance, like the Gardens Theatre, where you can go and get your theatre fix. The great thing about this theatre is that not only will you get professional plays, you also have a venue for up and coming performances which you don't necessarily get elsewhere. Keeping with the vein of the Law Courts, at the entrance to the Commonwealth Law Courts at 119 North Quay is the sculpture Equilibrium. Created by Akio Makigawa, the sculpture stands several meters tall. According to the sculptor, the focus is on the symbols of justice, the sword and the scales. The tall triangular form is the sword and is made of stainless steel. The white marble form at the top represents the scales and are symbolic of the equilibrium of good and evil. Akio Makigawa was born in Japan in 1948 and came to Australia in 1974, studying in Perth. He moved to Melbourne in 1981 and using this as his base, he became a leading Australian sculptor, with commissioned works in most states. After a severe illness, he passed away in late 1999. He has both written about and been the subject of a number of books on his works. I felt that the light when I took these shots was perfect. The moon had caused its own backdrop in the late afternoon light, and the different designs of each of the nearby buildings provided an excellent juxtaposition to the sculpture. The two materials of the sculpture itself also provide a fascinating contrast between the steel and the marble. Its also made me realise that I need to go into the courts on a day not on the weekend, as the inside foyer looks magnificent. Got a suggestion, or want Hi-Res copies of photos? E-mail me! I am a converted Brisbanite, after coming to Queensland from Victoria seven years ago. I've had in my head for the second part of 2006 to create a weblog about Brisbane and the things in the City I discover and enjoy. 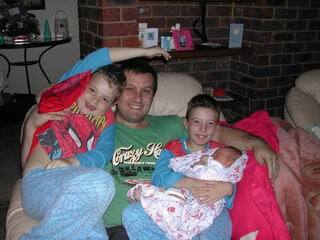 For 2006 I wrote a years WebLog as "Angry Dad 2006" purely as a light hearted look at bad parenting, and documenting our life in Brisbane daily for a complete year.